The chapter has placed eight historic markers at sites in and around the city of Sanford. Chapter members and their families have also donated historic items to the Museum of Seminole County History for display in the DAR Room. 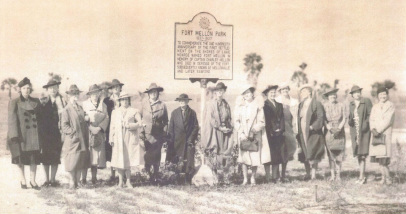 In honor of Seminole County's Centennial Festivities in 2013, the Sallie Harrison Chapter introduced the Marker Quest, a local scavenger hunt for the historic markers placed by the chapter. In addition to the placement of local historic markers, the Sallie Harrison Chapter has a long history of supporting the establishment and preservation of local historic landmarks, including the Gen. Sanford Memorial Library, the Seminole County School Museum, and Museum of Seminole County History. The chapter continues to work with local community-based organizations and historic societies to continue the preservation of our local history. February 8, 1957 - Dedication of the General Sanford Memorial Library established in the City of Sanford. In 1941, friends of the late General Henry S. Sanford, on behalf of his daughter, Carola Sanford Dow, approached the chapter. Mrs. Dow wished to present her father’s valuable papers, historical documents and portraits to the city he founded. The chapter raised funds by hosting Silver Teas, antique shows, bridge parties, and garage and rummage sales to build a replica of General Sanford's library. The City of Sanford, interested citizens, the Women’s Club and several local banks assisted with this project. In 1956, the Sallie Harrison Chapter saw its dream come true when the Sanford Museum opened at Fort Mellon Park. Historic Note: In 1875, a housing subdivision was built in Sanford near the site of Fort REID but it was named Fort Reed. A nearby train station also was named Fort Reed. It is assumed that these were named after Harrison Reed, the ninth elected governor of Florida (1868-1873). This has led to confusing about the spelling for the original Fort Reid. Historic Note: This fort was originally known as Camp Monroe, not Camp Fanning. According to chapter records, on February 8, 1942, a marker was placed near the site of the old cemetery on Mellonville Avenue. Much later, the city of Sanford moved the graves to the Lakeview (Old Sanford) Cemetery on General Hutchinson Highway (Route 46A), but no one knows what happened to the marker.